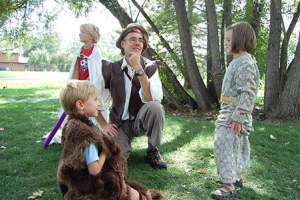 In Adventure Quest, the puzzles and mysteries, moral dilemmas, and other challenges of the quest are regarded with creative imagination as playful opportunities for experiential learning. 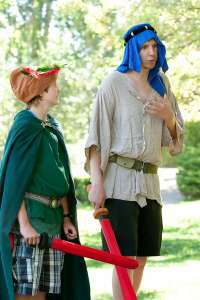 See also our Experiential Education Outcomes and an essay about how we support experiential learning through live action roleplaying games. The staff at Renaissance Adventures believes that a non-authoritarian and non-coercive teaching environment encourages a receptivity in children that enables them to develop their self-awareness. Children are supported in becoming empowered while learning skillful responses and non-abusive ways to resolve emotional and social distress. Small groups allow for personal attention and harmonious group dynamics. 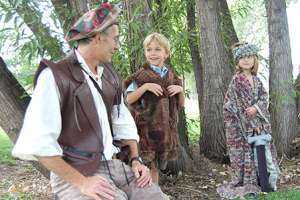 We quest in groups of 4-7 children with one skilled adult Quest Leader. In addition, some groups have a teen Counselors-in-Training (CITs). The small group size gives us the highest opportunity to lead your children on an inspiring experiential learning adventure. We believe that physical and emotional safety are equally important, and are the highest priority. Quest Leaders act swiftly and compassionately to uphold physical and emotional safety. Each child is respected, and each child is invited to act with respect to all. We role model and teach the children how they can resolve conflicts without resorting to name-calling, taunts, or bullying. We never punish a child for their unsafe behavior, but we let them know what the potential consequences will be if they repeat their behavior. We are happy to share our detailed strategy for promoting safety and respect through a system call “Inspiring Invitations.” Please call or email us for a request of this information. 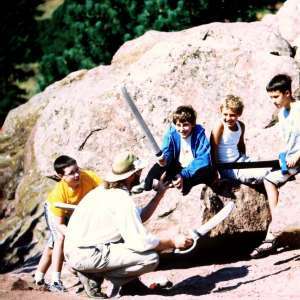 Renaissance Adventures employs the use of the Swasher – a teaching tool that children absolutely love. The safety rules are simple to learn, and are reinforced by the Quest Leaders. While our Swashers have been play-tested and designed with safety as the #1 priority, misuse can cause injury. We only allow Questers to play with the Swashers if they can do so safely. If you can any questions about Swashers, or if you are interested in purchasing, please call us at (303) 786-9216. Swords are symbols that aid us in opening a gateway into the mythic realms, reflections of which are seen in the knights of King Arthur and other legends. Moreover, swashers are a useful teaching tool for awakening in the youth a respect for physical safety and emotional boundaries, and an awareness and understanding of patterns of abuse and victimization. 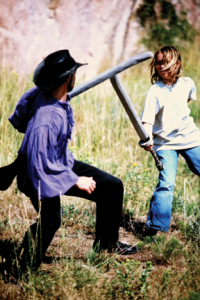 The use of Swashers also gives the Quest Leaders an opportunity to teach non-competition by addressing issues of competition that come up in the swordplay, and by guiding and role-modeling how to play fair, and how to be assertive while at the same time respectful and compassionate. Swashers are only one component of Adventure Quest. When a child or teen embarks upon a quest, they face many diverse challenges – ethical, moral, social, mental, physical, etc. The Questers are the heroes of the quest, and are called upon to promote peace in the imaginary land of Orania. So-called “villains” in our quests are generally not “evil,” and morality is not portrayed in stereotypical “black and white.” Rather, the “villains” in Adventure Quest have complex motivations and goals, and astute Questers must puzzle out the true source of the problems to come up with compromises, negotiations, and creative solutions to the difficulties that the kingdoms are wrestling with. The kingdom’s problems are not generally able to be fixed by the swinging of a sword! Interested in Swashers? See more information about swashers with games, safety rules, care & maintenance, and more.